Be active. Find a class near you. Joyce Indelicato, MEd, MS, Clinical Exercise Physiologist leads an exercise class specialized for individuals with Parkinson’s disease. The overall goal of the class is to help you move with more ease and confidence so you can continue to do what you enjoy. Working at your own pace, you will learn a variety of safe, simple exercises that you can do at home between sessions. Caregivers are welcome. 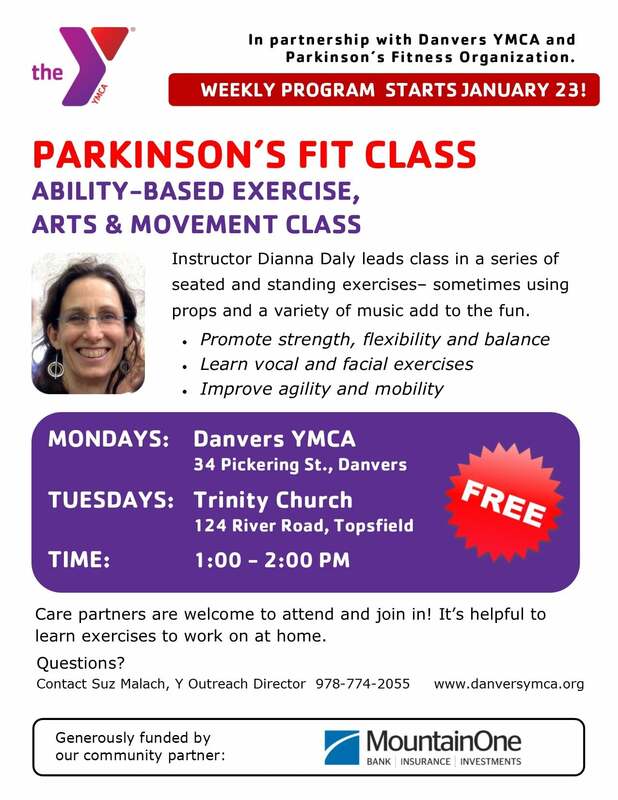 The Attleboro YMCA now offers a new, life-changing fitness and mobility program expressly designed for people with Parkinson’s disease. Led by a certified instructor, Delay the Disease is an evidence-based fitness program designed to empower those living with Parkinson’s by optimizing their physical function and helping to delay the progression of symptoms and helping to restore an improved quality of life. Exercise plans are adapted to all stages and levels of the disease. The class meets twice a week for 12 weeks. Participants may choose to continue the program beyond the initial 12 weeks. The exercise selection is designed to gradually improve overall fitness level. Each participant can go at their own pace and modifications will be offered for each exercise. Instructor Kim Crowley leads a combination of seated and standing stretching and strengthening exercises using weights and balls, balance pads, gliders, and bands. Participants challenge themselves through resistance training, obstacles, footwork, and dance to a variety of music. Memory and movement exercises, and facial/vocal exercises round out this class. Based on research to date, large amplitude whole body movements, agility work for coordination and balance, spinal flexibility, cardio-vascular training, high effort/ rate progressive strengthening and dual task training all appear to be important activities for people living with Parkinson’s disease. This exercise program developed and run by 3 physical therapists from Spaulding Cape Cod addresses all of these areas in a fitness center setting. For more information on HIT-PD, please contact Heather Merrill, MSPT, Dorian Robinson, PT at 508-240-7203, or Dawn Lucier, PT at 508-833-4165. Instructor Dianna Daly leads this movement class. A series of seated and standing movement exercises, sometimes using props such as balls, dowels, and balance pads to promote strength, flexibility, and balance. Participants are given tools through rhythm, dance, and movement sequences that help improve agility and mobility issues associated with Parkinson’s. Movement games, vocal and facial exercises, and a variety of music add to the fun. A series of seated and standing movement exercises, sometimes using props such as balls, dowels, and balance pads to promote strength, flexibility, and balance. Participants are given tools through rhythm, dance, and movement sequences that help improve agility and mobility issues associated with Parkinson’s. Movement games, vocal and facial exercises, and a variety of music add to the fun. Visit www.parkinsonsfitness.org for more information. Instructor Dianna Daly leads this movement class. A series of seated and standing movement exercises, sometimes using props such as balls, dowels, and balance pads to promote strength, flexibility, and balance. Participants are given tools through rhythm, dance, and movement sequences that help improve agility and mobility issues associated with Parkinson’s. Movement games, vocal and facial exercises, and a variety of music add to the class experience. The Leventhal-Sidman Jewish Community Center in Newton is now offering several types of exercise classes for people with PD. Contact the JCC for dates and times of current class sessions. For more information about each class, visit the JCC website here. Registration for all classes is required. Call 617-667-1276. This one-hour exercise class for people with Parkinson’s Disease is held once a week. The exercises target those areas most affected by Parkinson’s disease, including posture, balance, and coordination, as well as strength and range of motion. Starting with deep breathing and muscles of facial expression and ending with ankle strength and flexibility, the exercises provide a full body workout. Many of the exercises are performed while sitting. Most of the standing exercises are done using the back of a chair for support. Modifications to the exercises are made for those who have difficulty standing. This class is open to anyone with Parkinson’s disease. If a person requires assistance, we warmly welcome his or her family member or caregiver into the group. A small fee is charged. A script from a physician for Parkinson’s exercises is required. The Gleason Family YMCA offers a Parkinson Recovery exercise program with Instructor John on Mondays from 12:00 – 1:00 PM. The class is free for branch members, and costs $8 per session for nonmembers.